Collector, preservationist, educator and museum founder, Mitchell Wolfson, Jr. is dedicated to the research, preservation and education of the material culture of the period 1885-1945 through the Wolfsonian-FIU in Miami Beach, the Wolfsoniana Museum in Genoa, Italy, and an evolving study centre in downtown Miami. Raised in Miami Beach, Wolfson gained an early appreciation for the built environment and its relationship to cultural factors. Extensive travel and work overseas provided him with opportunities to amass an extensive collection of British, Dutch, German, Japanese, Italian and American design. 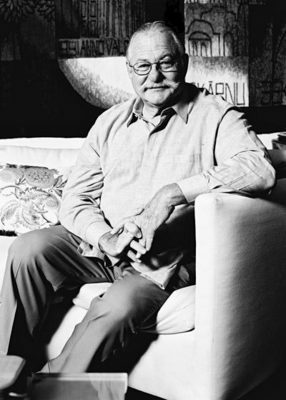 In 1986 he established The Wolfsonian Foundation, a research center and museum in Miami Beach and began publishing The Journal of Decorative and Propaganda Art, an internationally acclaimed and award-winning publication dedicated to fostering scholarship in late nineteenth and early twentieth century design arts. In 1997 he donated his collection, estimated at 80,000 objects, and the state-of-the-art museum to Florida International University. The Wolfsonian-FIU continues to be a respected research center and museum with an ambitious program of exhibitions, publications, educational programs and scholarship. Mr. Wolfson was named Travel + Leisure Design Awards 2011 Design Champion In 2007, Mr. Wolfson was awarded the 11th Premio Rotondi ai salvatori dell'arte (Rotondi Prize to Art Rescuers) for his lifelong commitment to the preservation of art and architecture, as well as the 2007 Stewardship of Modernism award by the Russell Wright Design Center in New York. He co-authored the 2005 publication, Miami Beach: Blueprint of an Eden, with artist Michele Oka Doner. A trustee for the Mitchell Wolfson Sr. Foundation and the Mitchell Wolfson Family Foundation, he is also a member of the International Council of the Museum of Modern Art and the International Council of Les Arts Décoratifs in Paris. Additionally, he serves on the Executive Planning Committee of the Bard Graduate Center: Decorative Arts, Design History, Material Culture. A graduate of Princeton University, Mr. Wolfson remains on the advisory council of the university’s Comparative Literature department. He received his master’s degree in international relations from the Paul N. Nitze School of Advanced International Studies, Johns Hopkins University. Mr. Wolfson divides his time between Miami, New York, Paris and Genoa.